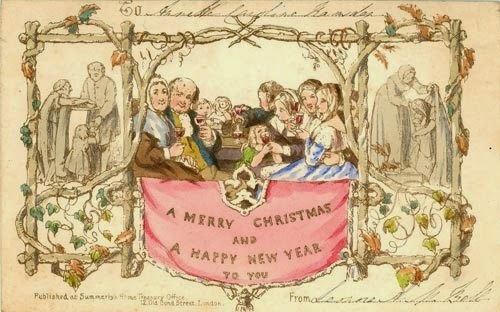 Sending Christmas cards first became popular in England over 150 years ago. In the 1840’s John Calcott Horsely was a curator at the royal museum. He was late sending his usual holiday letters to his friends and relatives for Christmas so he asked the artist, Sir Henry Cole, to design and hand-color 1,000 cards. Horsely wanted the card to show people being fed and clothed to remind his friends of the needs of the poor during this season. Cole’s card depicted a happy family raising their glasses to toast the season. 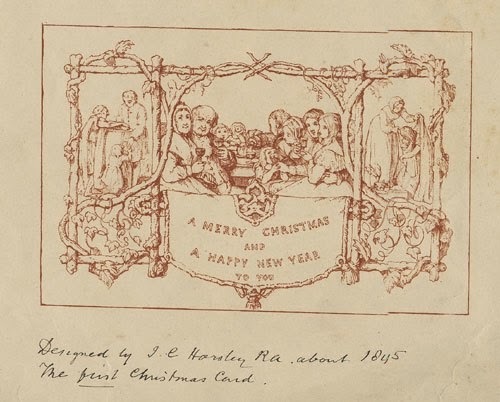 “A Merry Christmas and a Happy New Year to You” was printed on that first card. Horsely had a thousand copies of the card made and sent them to his friends. But in 1843 the cards went on sale and caused quite an uproar when the public thought that the scene on it encouraged the immoral behavior. 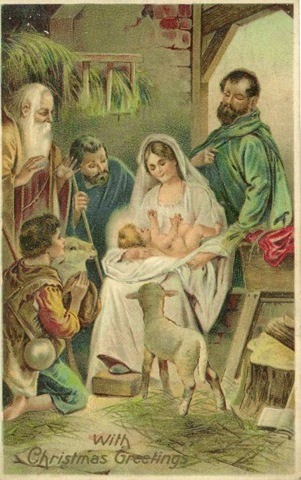 Artist's proof of first Christmas card. Some people disliked the idea of sending holiday greetings, thinking it was foolish. At first, cards were not signed or mailed. They were hand delivered by a messenger with a calling card that had the sender’s name on it. Postage was only afforded by the wealthy, but when the Penny Post was invented in 1840, which carried mail by railway, people could buy a stamp for one cent. Cards were handmade, embossed with gold leaf and printed on expensive paper, many people could not afford to buy them either. By the mid 1850’s commercial printing made the cards cost less and soon people were sending cards around the world. More artists began creating beautiful cards. In the late 1800’s and early 1900’s other card designers became popular. Many of them were female artists and children’s illustrators. The cards were often decorated with fringe, silk, and satin. 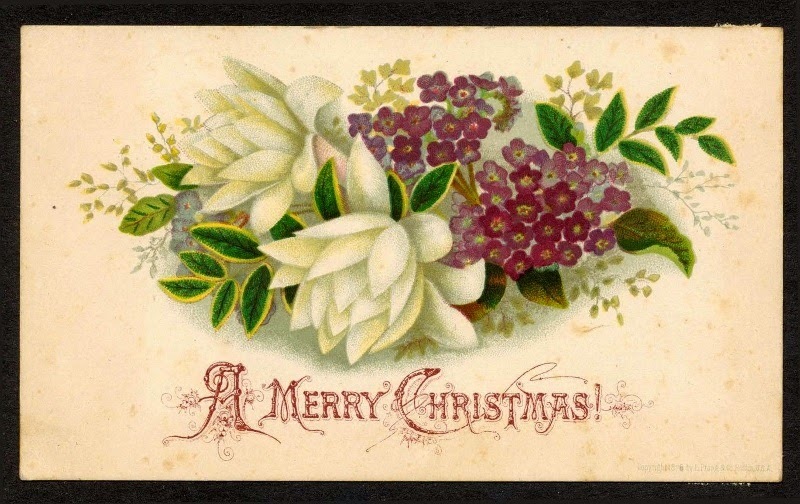 Early Christmas cards were less likely to show classic Christmas themes, but instead birds and flowers were common. Americans had to import their greeting cards from England and Germany. Then in 1875, Louis Prang, a lithographer from Prussia, came to the U.S and opened a shop publishing the first line Christmas cards in America. He is considered "the father of the American Christmas card." By 1881 he produced more than five million cards each year until the 1890's when inexpensive Christmas postcards from Germany took over the market. The Christmas penny postcard remained popular in the U. S. until the outbreak of WWI which closed off the market of German imports. 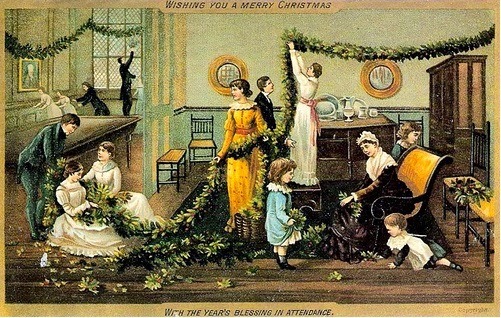 During the first 70 years of the 19th century it was common for Christmas and other greeting cards to be recycled by women’s service organizations who collected them and removed the pictures, to be pasted into scrap books for the entertainment of children in hospitals, orphanages, kindergartens and missions. This was before the time where many children’s picture books were printed. Do you send Christmas cards? Do you keep the ones you receive? A Christmas surprise giveaway for one of our commenters from Carla: Two book set of A Cup of Christmas Cheer, Vol. 3 & 4 (see description below)! Carla Olson Gade's publications include three Christmas books that you might enjoy reading this season including "'Tis the Season" in bestselling Mistletoe Memories. "Upon a Christmas Tree Schooner" is included in the Vol. 1 & 2 set of A Cup of Christmas Cheer from Guideposts Books. 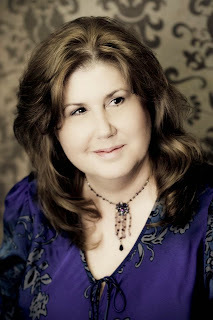 Carla's story "The Memory Shop" is featured in this year's Vol. 3 & 4 set of A Cup of Christmas Cheer. You may connect with her online at Adventures of the Heart. From Carla's heart to yours, Merry Christmas! Love your post! I do send Christmas cards and I keep my cards. Those that send pictures, I keep the pictures for years and years. Me, too, Melanie! Its really nice to get photos with the cards, or photo-cards. I love seeing how individuals and families grow and change through the years. I don't send Christmas cards any more. If I am not going to see the person over the Christmas holidays I telephone them. I keep the cards & make the next years gift cards from them. How nice, Janet. I'd have probably picked those up if it were me. Great job on the newsletters. I'm sure your family and friends love getting the annual updates from you. My Mom does that too and I got mine today. Of course I pretty much already know all about the content, but I love seeing it all gathered together. I keep these newsletters as momentoes of years gone by since she does such a great job. My mom has a few cards left from the 1960s. I love looking at them! I was looking at some 1960's cards recently when I researched for my story "The Memory Shop" in A Cup of Christmas Cheer. It is interesting to see how the times have changed and the various motifs and styles used through the years. How talented you are for designing cards. My favorites are often the ones others have made, they are always keepers! I love these old cards. They're beautiful. I just sent out our batch of Christmas cards to family and close friends we don't see often as well as a few special friends we remember at Christmas. I do save my old cards, especially ones with pictures of families on them. It's so much fun to go back and compare them and see how children have grown. One year I cut off the fronts and made place mats by cutting poster board to size, gluing on the pretty cards and trimming the edges in ribbon or rick-rack and then laminated them. They lasted for a number of years. What a great idea for re-purposing your cards, Martha! And Merry Christmas to you and yours as well! Some years I'm better at sending cards than others. Last year a friend, who works in a cardio rehab center, asked for old calendars and Christmas cards we weren't saving. She turns the pictures into laminated place mats for nearby nursing and assisted living homes. I like Martha's idea of doing that for cards I keep. Adding the message sides when the greeting is especially meaningful will add to the memories. Thank you for this post Carla. Merry Christmas. Merry Christmas to you, Linda! That sure is a nice craft for shut-ins.And I like the idea of including the messages to make it more meaningful for your own keepsake. I know some people also like to make gift tags out of old cards as well. I love this post and I love sending and receiving cards! I have noticed, though, that people don't send cards like they once did. I enjoy keeping my cards and have several that I treasure. Merry Christmas! Each year I bring out a pile of last year's cards from my Christmas decorations box and look through them over again. I'm not great at sending cards, except to very close friends and relatives, but this year I'm sending a bunch! Merry Christmas, Britney! Thanks, Susan! And Merry Christmas to you and yours, my friend! Thank goodness for those folks who have been keeping the card sending tradition alive. But it is fun to see the photo cards that a lot of younger families are getting printed these days. I have an aunt who has been doing family photo cards for at least 30 years! Just got mine today and this year there is a grandchild on it!. What fantastic cards. Thanks for sharing. For years, each Christmas we select our favorite card we received and we frame it. I have a large collection of them and display them each Christmas. That's a fantastic idea and an inexpensive and sentimental decorating idea. Merry Christmas, Susan! I like saving the cards and some years I use them to decorate my walls again. I enjoy the ones my mom used to send me. They keep her close. Yes, cards are great mementos. I hear you about saving the ones of those especially dear to us. Merry Christmas, Anna. Britney Adams, you are the winner of my giveaway for A Cup of Christmas Cheer, vol. 3 & 4!